Organic electronics are now applied on several fields including display, lighting, photovoltaics, and sensor applications. Organic light emitting diode, OLED, is the highest market value among these organic electronic applications. The premium displays are usually adapted OLED technology. The major players of display manufactures all make their effort on the mass production of AMOLED display due to its high quality. A 10 billion market of OLED display has been realized in 2013. Another featured application of OLED is lighting. OLEDs aren’t just for luxury lighting any more. The efficacy and luminance of OLED lighting panels are reaching levels for offices and homes. A latest forecast of the OLED lighting by NanoMarket predicts a $1.4 billion market opportunity in 2019. OLED capacity will continue to grow in the next three years. OLED (Organic Light Emitting Diode) is an organic materials based light source. 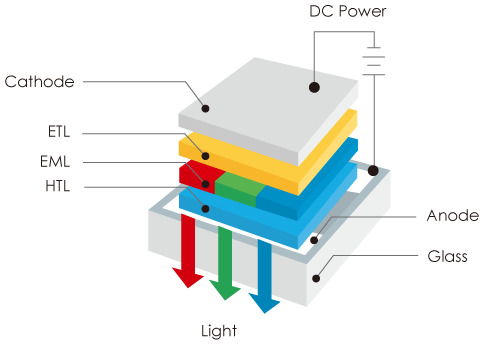 The major layers of OLED are comprised of EML (Emissive Layer), ETL (Electron Transport Layer) and HTL (Hole Transport Layer). When a voltage is applied to the electrodes the charges start moving in the device under the influence of the electric field. Electrons leave the cathode and holes move from the anode in opposite direction. The recombination of thess charges at EML leads to the creation of a photon with a frequency given by the energy gap. Therefore, the electrical power applied to the electrodes is transformed into light. The generated green, red, and blue lights are accordingly dependent on the band gap of materials. Color appearance objects seem to be blue-skewed under LED light Good color saturation of objects under OLED light. 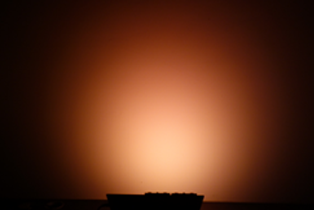 OLED can provide 1800K warm white, similar to the sunset lights. 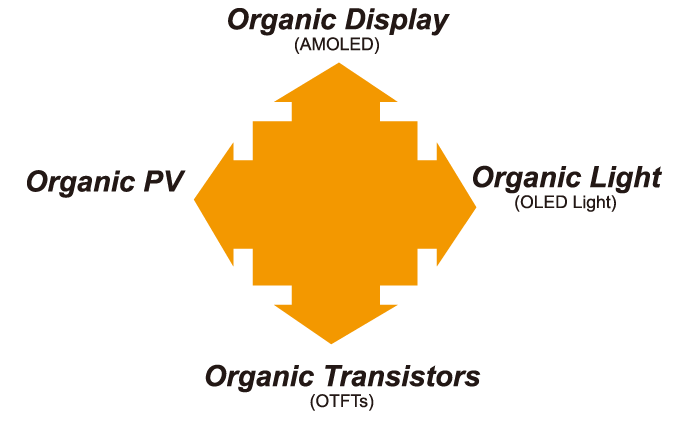 Carbon, Hydrogen, Oxygen, and Nitrogen are major elements of organic materials of OLED. It contains no hazardous substances and is also recyclable. OLED does not emit UV ray which damages the human beings’ eyes. 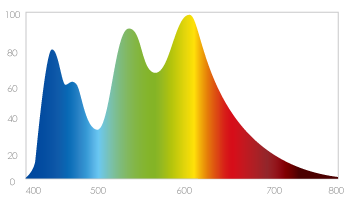 OLED light is comprised either of three colors (red, green, and blue) or of two colors (blue and yellow). For healthy reason, the designer can control the peak wavelength of blue light. 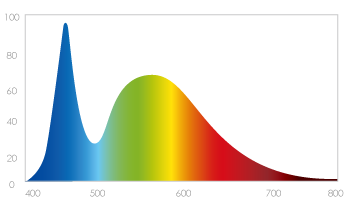 We can adapt the longer peak wavelength (>460nm) of blue light. It will be healthier and more comfortable for your eyes. OLED is a uniform area light source. 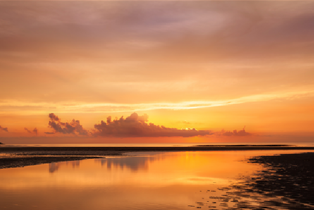 It produces high-quality soft light with no glare. OLED lighting panel is very thin and lightweight. The thickness of UMAGE’s OLED lighting panel is about 0.8mm. 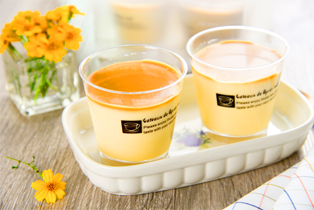 Moreover, it is touchable and easy to handle as they produce little or no heat (about temperature). OLED technology is allowable to create free-form lighting on flexible carrier and transparency materials. Designers will have more freedom than ever before. The possibilities are endless. © UMAGE 力志國際光電股份有限公司 2014	| Theme: upBootWP by upplex.